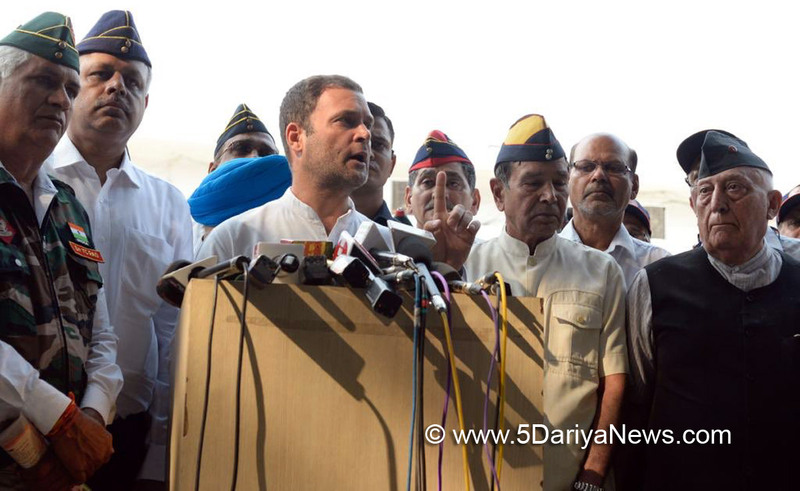 Congress President Rahul Gandhi on Saturday stepped up his attack on Prime Minister Narendra Modi over the Rafale deal and accused him of cheating the Army veterans over the One Rank, One Pension (OROP) and vowed to fulfill the promise. "We had a very instructive meeting today. Couple of things came up, the OROP came up and the ex-servicemen said that it has not been implemented by the Prime Minister," Gandhi told media after meeting the ex-servicemen at the party headquarters. "I want to tell you that the commitment which the COngress made in 2014 over OROP, we would fulfill that," Gandhi said.The Congress chief said that several issues like situation in Jammu and Kashmir -- the wrong non-strategic approach of the government, the division being created and the cost that is being paid by our soldiers and the Rafale deal came up in the meeting. "And these things are connected. The connection is that Anil Ambani can be given Rs 30,000 crore for doing nothing and our soldiers cannot be given OROP," he alleged.He said that Rs 30,000 crore was more than enough to solve the OROP problem as it only required Rs 8,330 crore. "But he gave Rs 30,000 crore to a person who has no experience," he alleged. He also slammed Modi for not spending on the armed forces and said: "You (Modi) are ready to give that money for the future, for the weapon. It is the main issue here. "The Congress chief said that he felt very sad, the way in which the ex-servicemen showed their displeasure over a number of issues in the meeting. "They have been hurt and the the way in which they are being treated was not good and the government need to change its attitude," he said.Accusing the Prime Minister Modi of changing the procedure in the government-to-government deal to buy 36 aircraft from French firm Dassualt Aviation, Gandhi said, "One hundred twenty-six aircraft at Rs 526 crore apiece was negotiated by the Indian Air Force and the Defence Ministry. The Prime Minister then stepped in and cancelled the earlier deal, and signed a new deal and bought one aircraft for Rs 1,600 crore. "He gifts the deal to the man who has a bank debt of Rs 45,000 crore but he did not give that amount to the ex-servicemen," he alleged. Armed forces veterans have long asked for the same pension for all, regardless of rank, length of service, and irrespective of the date of retirement. The defence ministry had reinstated the OROP scheme in September 2015, and formally notified it for more than 24 lakh ex-servicemen and six lakh war widows on November 8, 2015.